In the wake of monumental state legislation passed earlier this year to regulate the medical marijuana industry, local cities and San Luis Obispo County are rushing to pass cultivation regulations before a March 1, 2016, deadline. Both the city of SLO and SLO County will be considering the issue at their respective Dec. 15 meetings. At those meetings, decision makers will discuss whether or not to consider bans on the cultivation of medical marijuana. The new law requires that localities have regulations for cultivation in place by March 1 or they will defer to state guidelines. The Medical Marijuana Regulation and Safety Act (MMRSA) includes a trio of bills—AB 243, AB 266, and SB 643—that create a wide set of laws to regulate medical cannabis, including cultivation, transportation, manufacturing, testing, delivery, and retail sale. CHRONIC GREEN AND GRAY AREAS: The San Luis Obispo County Board of Supervisors and the SLO City Council will both be discussing ordinances on the cultivation of medical marijuana at their respective Dec. 15 meetings. New state laws that regulate medical marijuana require localities to draft policies regulating the cultivation by March 1, or they’ll lose local control. The law will take effect in 2018, and will require those in the industry to obtain licenses from the state. In order to get a state license, an operator must first receive a local permit, a provision created so city and county governments can maintain local control over medical marijuana activities. That stipulation has inflamed the nerves of the local medical marijuana industry and its patients because every city in SLO County has already effectively banned brick-and-mortar dispensaries; delivery services are banned in some cities; and in the unincorporated areas, a handful of attempts to open a dispensary have fallen victim to the county’s strict zoning codes and the contentious political nature of medical marijuana. 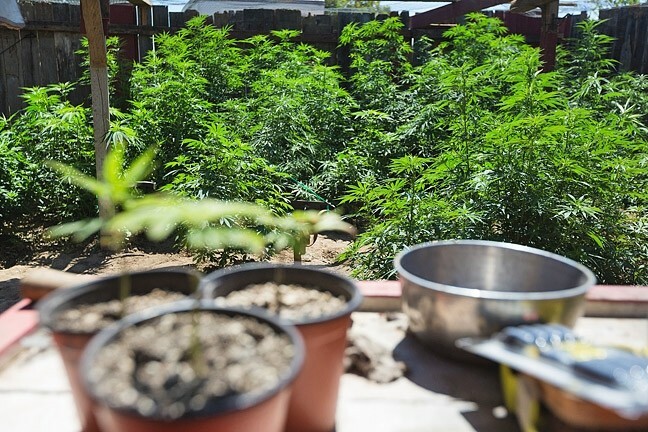 The March 1 deadline for cultivation ordinances has created a mad dash to take necessary action to avoid local control being ceded to the state. That deadline, which was written into AB 243 but intended for removal, was mistakenly left in the bill during last minute negotiations in the lead-up to the bill’s passage, said Paul Ramey, spokesperson for Assemblymember Jim Wood (D-Eureka), the bill’s author. Since then, Ramey said Wood has pledged to introduce clean-up legislation that will remove the deadline as soon as the legislative session begins in January. Nonetheless, the ordinances are in motion. Arroyo Grande already started the process of considering a ban on cultivation, and several other cities are considering options. On Dec. 15, the SLO County Board of Supervisors will be discussing the issue during its afternoon session (1:30 p.m.), and will be asked to give direction to staff on how to proceed. The city of San Luis Obispo will also be considering the issue that evening (6 p.m.). Both bodies are aware that the deadline might be struck but are still moving forward with a better-safe-than-sorry approach in case the bill’s clean-up language isn’t passed in Sacramento. SLO City Attorney Christine Dietrick told New Times that the general consensus among municipalities is that whatever is passed now can be revisited and amended at a later date. “It’s a preservation of local control issue, because you want the council to have the full pallet of options,” Dietrick said. The SLO City Council will be asked to clarify the city’s permissive zoning language, in which any specific use not explicitly stated is, by default, not allowed. Because the city doesn’t currently permit or issue business licenses to brick-and-mortar or mobile delivery dispensaries, those forms of business are effectively disallowed. The city attempted an outright ban on deliveries and cultivation in May 2014, but tabled it after hearing an outpouring of impassioned comments from residents who said that they depend on medical cannabis and that those policies would severely limit their access. On Dec. 15, the council will be asked to clarify whether cultivation is or isn’t allowed in the city’s permissive zoning scheme, according to Dietrick. The SLO County Board of Supervisors will hear a wider menu of options on Dec. 15, which, according to its staff report, include amending the general plan to ban or regulate cultivation within the county’s jurisdiction (unincorporated areas) or pass an urgency ordinance that would buy the county some time to sort out a permanent ordinance. “The most viable approach to ensuring local control suggests that the board should pursue an urgency ordinance to maintain local control, particularly given the difficult constraints being driven by evolving legislation,” the staff report said. An urgency ordinance requires four out of five votes to pass.